Taman Ternak (Cattle Farm) Pondok Ranggon which is located on Jalan TPU Pondok Ranggon, Cipayung, East Jakarta is now used for educational tourism object. Tens of dairy cows are placed in this 3,000 square meters land.
" Each student groups who visit this site will be educated about how to raise a cattle"
Maritime Agriculture Food Tenacity Dept. 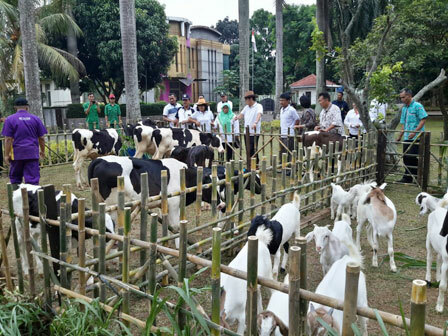 's Cattle and Animal Health Service Center Unit Head, Renova Ida Siahaan said, initially Taman Ternak Pondok Ranggon has been prepared for educational tourism object. Thus local residents, especially students can utilize it. "Each student groups who visit this site will be educated about how to raise a cattle. Then visitors will get a chance to learn how to milk a cow and also provide its food and drink," she informed, Wednesday (5/16). According to him, there are 25 dairy cows in this cattle park. His side has cooperated with Jakarta Small Medium Enterprises Cooperation and Trade to enliven this site. Besides, UKM product promotion center has been also built in the area. "Starting this year, we will reactivate this promotion building. Thus UKM product exhibition, dairy products, and others can be continued," he added. Meanwhile, East Jakarta Assistant for Economy and City Development, SyofianTaher suggested to give socialization about this educational tourism to schools in the neighborhood. Not only learn about dairy farming, but children will also learn how to farm. "Thus this tour can give more benefits to its visitor," he stated.